During autumn 2016 the Merwede bridge on the A27 in the Netherlands was closed for heavy traffic for 2 months. The reason was the presence of fatigue cracks close to a critical length. The firm Berenschot did investigate the process of closing the bridge. Based on their evaluation report, 2 professors claimed that The Netherlands just escaped from a disaster; the Merwede bridge had a residual life of only 6 days. A little later another professor claimed that there was no problem; the critical cracks were detected in time. Since I’m working already some time (35 years) in the field of fatigue and because I was curieus what was going on, I have tried to make an attempt to clarify one and the other. Let’s see what fatigue actually is. Fatigue occurs when a structure is subjected to cyclic loading. If the stress amplitude exceeds a threshold value, microscopic cracks will initiate at locations with high stresses (stress concentrations). At first, the cracks propagate very slowly and remain undetectable for the bare eye for most of the fatigue life. Gradually the crack propagation rate increases and the cracks will become visible (detectable, point A in the figure below). Eventually the crack will reach a critical size (point B in the figure below) and the structure does not function as required anymore (e.g. too much deformation, partial failure, etc.) or even the full structure will fail. 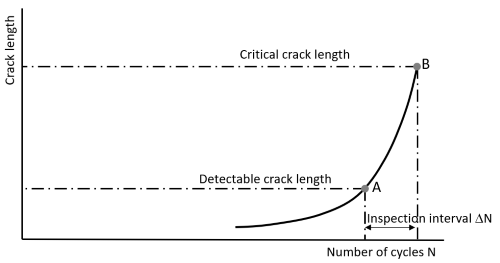 The critical crack length is determined by the fracture toughness of the material. At a given load the fracture toughness yields a critical crack length, and vice versa, at a given crack length the fracture toughness yields an allowable load. Determination of the time (number of cycles) until the moment a crack becomes visible (i.e. fatigue initiation) is difficult. There are too many factors affecting initiation to perform an accurate analysis. Moreover, those factors cause a lot of scatter. Put two identical bridges next to each other with the same usage: The time to detectable crack lengths may differ significantly (orders of magnitude). On the other hand, the crack growth period from detectable to critical length is much easier to determine. For such an analysis, good calculation models are available. These models are used to determine inspection intervals. Such an analysis assumes that if no crack is found, a crack just a bit shorter than the detectable crack size may be present. The calculated inspection interval is the period a crack needs to grow to a length just below the critical size. Often, this interval is divided by a safety factor. In civil aerospace this factor equals 2. The Berenschot report states: “Vanaf half juli 2016 is belastingonderzoek gedaan naar de Merwedebrug door GPO en RWS WNZ in samenwerking met TNO en meetploegen. Bij belastingonderzoek doen meetploegen metingen en rekent TNO deze vervolgens door en toetst deze aan een model. De meetresultaten volgen de modellering; dit zegt iets over de betrouwbaarheid en voorspellende waarde hiervan”. [In short: Starting half July 2016 research on the Merwede bridge has been performed by GPO and RWS WNZ supported by TNO. Measurements are done and checked with a model by TNO. Measurements are in agreement with calculations]. Since the report also states that measurements are used for crack growth calculations I will assume that the measurements are crack length measurements. To my knowledge acoustic emission techniques were used to locate cracks and ultrasonic techniques were used to determine cracks lengths. In the end, cracks were found at the riveted joints in the bottom of both longitudinal beams. In one of the joints, the situation was critical. It is reasonable to assume that a critical crack length has been determined prior to inspections. This requires the fracture toughness of the material. The fracture toughness can easily be established by testing, but is often derived from Charpy V notch test data. This derivation is not very accurate, so some conservatism will be used in the critical crack size calculation. Further, the fracture toughness itself shows scatter. Usually a minimum value for the fracture toughness is used, to reduce the probability of failure. Apparently the measured crack length at the critical location was close to the critical crack size. Crack growth calculations indicated that the critical crack length would have been reached after 6 days. That does not mean that the structure would fail for sure after 6 days, it merely means that the propability of failure after 6 days would be equal to the propability of failure used for the calculation of the critical crack length, i.e. very small. It looks like, based on the above, that the claim The Netherlands were close to a disaster is rather far-fetched. The probability of failure of the riveted joints after 6 days was very small, moreover the bridge would not have been completely collapsed but heavily damaged. The decision to close the bridge for heavy traffic was a logical decision. The load on the bridge decreases, allowing a longer critical crack length. What would have been happened if there was no study into expansion of the traffic capacity of the Merwede bridge. The way I look into it, there would have been no investigation into the condition of the bridge and cracks would have been remained undetected until failure of the joint. That would have been resulted in considerable damage of the bridge and possibly closure for all traffic. Although the bridge is already 55 years old and has covered a large part of that life without fatigue damage it does not mean there will never be any damage. Especially the increase of traffic intensity (more and heavier traffic) may lead to a situation that the fatigue life of a structure will shift from infinite to finite during its life. 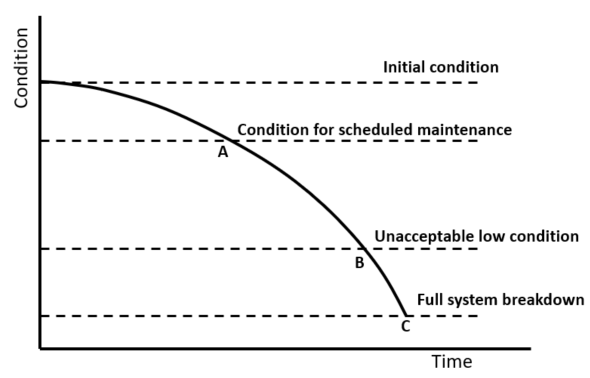 It seems to me that checking if boundary conditions used for making maintenance programs are still valid is not done systematically but only ad hoc basis. If my impression is correct, it is something to worry about. What was the goal of the measurement campaign started in July 2016? b. Extensive measurement campaign to obtain insight in the crack growth process in the bridge. The way I understand, it is option b. For both options you may ask: How often are the crack lengths measured in the riveted joints. Usually, the inspection interval is determined by the crack growth rate and divided by a safety factor. If the actual inspection interval was (much) smaller than the calculated interval, it is remarkable that the crack length in the critical joint was so close to the critical crack length. 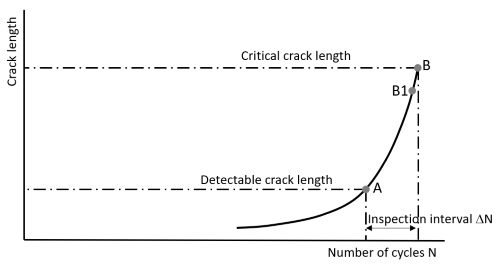 The critical crack length is calculated using the fracture toughness. From safety point of view this is of course fine. From economical point of view it is not. An aircraft being checked on cracks in a maintenance workshop is out of operation at that time. If cracks are found, they will be repaired inmediately. A bridge however is continuously in operation. If cracks are found close to the critical length it means restrictions to traffic until cracks are repaired. Taking the bridge out of operation is not acceptable. In case of the Merwede bridge, the traffic restrictions implied closure for heavy traffic. It seems covenient to me to use a kind of operational critical crack length, point B1 in the figure below, that is shorter than the calculated critical crack length. Such a crack length allows to use the period from point B1 to B for repairs etc. without restrictions to traffic. According to the Berenschot report the measurements agree with the calculation model. If that is correct, the question arises why there hasn’t been intervened earlier. Based on the model it should have been seen that crack lengths were close to critical sizes. Above questions are based on the assumption that inspections in October 2016 were not the first inspections on the riveted joints. The question is if this assumption is correct. The assumption seems very reasonable. A riveted joint is often a critical location in a structure. It is not logical to assume that such a location will inspected only after 3 months after beginning of the measurement campaign. The Berenschot report states that measurement results are in agreement with modeling results. This implies that there should be multiple measurements. However, the fact that in October 2016 cracks are found close to the critical size together with the startled reactions of the involved people suggests that this could be the first measurements anyway. Do you want to receive our blog articles in your mail box? Subscribe to our newsletter.